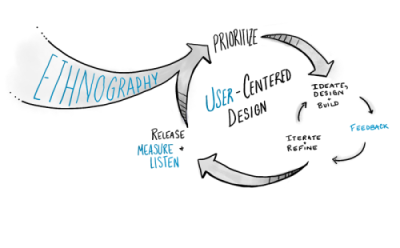 Does the human-centered design industry believe in it’s own process? Listening to users, and incorporating their feedback is considered the key differentiator for the practice of human-centered design. Yet, one wonders, if the design industry has understood that this philosophy must necessarily include the feedback from their clients as well. That is, while we are all aware of the navel gazing tendencies displayed by design thinkers and writers, we very rarely come across any pragmatic criticism of the industry itself, and it’s approach and processes, by those purchasing their services. Yesterday, during my reading on ‘Doing Development Differently’, I came across an incisive critique of what can only be called Big Design, by Geoff Mulgan, the Chief Executive of Nesta – the UK’s innovation foundation. His insights are worth pondering. One could almost interpret this as saying that human centered designers are unable to incorporate user feedback. I’ve several times sat in meetings with designers and design promoters, alongside policymakers, where the same pattern has repeated. The policymakers grudgingly accepted that they might have quite a bit to learn from the designers; but the designers appeared baffled when it was suggested that they might have something to learn from the policymakers, or from the many other organisations and fields with claims to insight into service design: social entrepreneurs, professions, consultancies, IT, policymakers. There are plenty of exceptions to this rule: but overblown claims that design methods are uniquely placed to tackle complex, holistic problems has not always helped to inspire a culture of collaboration and mutual learning. When an overweening sense of one’s place on the team overrides ‘deep craft’, what are the future implications for the designer’s role in shaping their own environment? And, what are the ramifications for the entire design industry, when Big Design’s Big PR hampers progress more than it helps?